Back in the day, the measure of a muscle car was elapsed time in a quarter-mile. Not anymore. The 2007 Dodge Charger SRT8 offers a complete performance approach with its infusion of Street and Racing Technology (SRT) DNA into the Dodge formula of "bold, powerful and capable." With the Dodge Charger - which has re-established the famous Dodge performance nameplate - as a starting point, adding SRT DNA means 6.1-liter, 425-horsepower (317-kW) HEMI® power, world-class ride and handling, benchmark braking, functional and aggressive-looking exterior enhancements, and a race-inspired interior. "The 2007 Dodge Charger SRT8 offers more than big-bore SRT power under the hood," said Kipp Owen, Director - Street and Racing Technology, Chrysler Group. "It's an all-around performance package: superb handling, tremendous braking and no-nonsense performance enhancements to the exterior and interior." The 2007 Dodge Charger SRT8 is capable of all-around performance that is simply remarkable in a muscle sedan: 0-60 mph in the low 5-second range, quarter-mile time in under 14 seconds, braking distance from 60 mph in approximately 110 feet and 0.89 g on the skid pad. The Dodge Charger SRT8 is also capable of accomplishing SRT's signature performance test of 0-100-0 mph in less than 17 seconds. 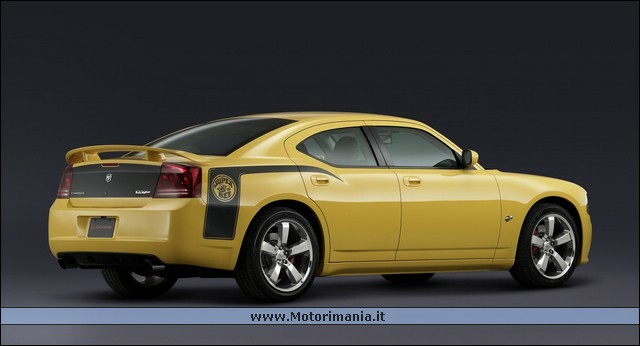 Trevor Creed, Senior Vice President - Design, Chrysler Group: "The Dodge Charger's overall design suggests speed and performance, attributes that are accentuated in the Dodge Charger SRT8. SRT touches such as the front air dam, hood scoop and rear spoiler are not only visual hallmarks of a true muscle car, they're also functional performance enhancements." That functional performance is reflected in the exterior of the 2007 Dodge Charger SRT8 in the front fascia, which integrates ducts that help direct fresh air to cool the brakes, and an air dam to reduce lift. The hood is equipped with a scoop to funnel cool air into the engine compartment. The rear fascia features integrated lower strakes to direct air flow, and aggressive cutouts to accommodate dual 3.5-inch exhaust tips. A dramatic deck lid spoiler set on dual stanchions increases downforce for high-speed stability and traction. Race-inspired interior appointments in the 2007 Dodge Charger SRT8 start with power-adjustable, deeply sculpted and highly bolstered sport seats in the front, fitted with performance suede inserts to hold occupants during maneuvering. Rear seats have matching performance suede inserts. All seats have contrasting red stitching. Full instrumentation includes a 180-mph (300-kph) speedometer, a tachometer and a temperature gauge. A light-emitting-diode (LED) display within the gauge cluster is driver-configurable for oil temperature, oil pressure and tire pressure readouts. Kipp Owen, Director - Street and Racing Technology, Chrysler Group: "The Dodge Charger SRT8 starts with a 6.1-liter HEMI engine making 425 horsepower and 420 lb.-ft. of torque, and continues with race-bred technology including gas-charged dampers, tuned anti-sway bars and Brembo brakes. 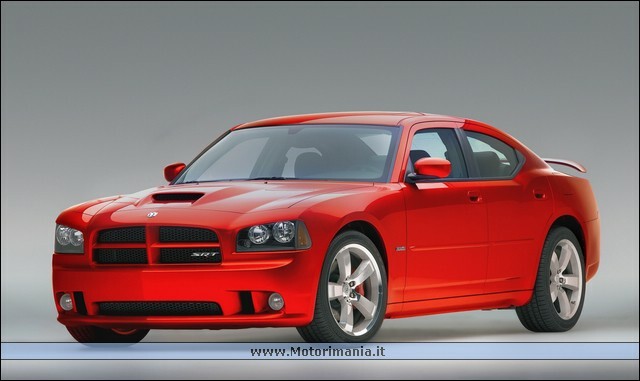 And Dodge Charger SRT8 follows the SRT credo of offering the best performance at the best price." The 2007 Dodge Charger SRT8's 425-horsepower (317-kW), normally aspirated 6.1-liter HEMI produces 420 lb.-ft (569 Nom) of torque, achieved by adding cubic inches, increasing the compression ratio, and redesigning the cylinder head and intake and exhaust systems for better flow and increased engine speed. Power for the SRT 6.1-liter HEMI is channeled through a five-speed automatic transmission with specially calibrated, driver-selectable Auto Stick, which offers fully automatic or manual shifting selection. Chassis enhancements on the 2007 Dodge Charger SRT8 include SRT-tuned dampers, tailored spring rates and suspension bushings, and large-diameter anti-sway bars. The ride height of the 2007 Dodge Charger SRT8 is one-half inch lower than the Dodge Charger. Handling is engineered for performance with an Electronic Stability Program (ESP) tuned for the 2007 Dodge Charger SRT8. Benchmark braking performance comes from Brembo four-piston brake calipers on all four wheels, gripping a vented disc - 360 mm x 32 mm up front, with 350 mm x 26 mm in the rear. Dodge Charger SRT8 is the ultimate modern American muscle sedan - "Charger on steroids"
"	Functional, performance-oriented exterior design features 20-inch SRT wheels, 3.5-inch chrome exhaust tips, all-new front and rear fascias with air dam and cooling ducts, and functional hood scoop and rear deck lid spoiler. Race-inspired interior appointments include deeply bolstered seating and comprehensive instrumentation. All that combined with benchmark braking and world-class ride and handling characteristics make the Dodge Charger SRT8 civilized enough for a grocery run but fully capable in more challenging situations. Dodge Charger SRT8 is the latest incarnation of a storied Dodge performance nameplate, combining SRT performance attributes with Dodge attitude.
" 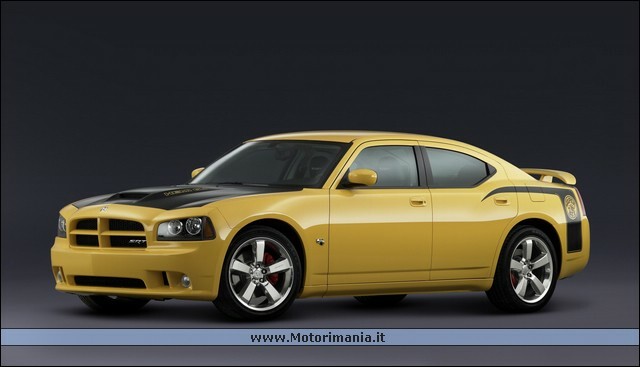 The ultimate modern American muscle sedan - the "Charger on steroids"